First of all, don’t get anxious just because USCIS sent you an appointment notice for an I-485 interview. Almost everyone must go through an interview during the adjustment of status process. In fact, there’s reason to get excited. The I-485 interview is likely the last step in your application process. If all goes well, you’ll be a permanent resident (green card holder) at the end of the interview. Interviews are a standard part of the process after filing Form I-485, Application to Adjust Status. The I 485 interview is almost a certainty if you submitted an adjustment of status application on the basis of marriage. USCIS may waive the interview for some applicants with especially straight forward cases with strong evidence. But this is the exception. USCIS will generally schedule the interview at an office nearest you. In some areas of the country, this may require a long drive and an overnight stay. In many cases, USCIS requires both the applicant and petitioner to attend the I-485 interview. As previously mentioned, the petitioning spouse and applicant should expect to attend an interview for marriage-based cases. In some non-marriage based cases, USCIS may require only the applicant to attend the adjustment of status interview. USCIS does not require employers to attend interviews for employment-based I-485 applications. Government-Issued Photo ID. Typically your passport (even if expired) but can also be any other government-issued photo ID like a driver’s license. A complete copy of your adjustment of status application packet. In addition to Form I-485, have available any other forms (e.g. I-130, I-130A, I-864, I-131, I-765) you may have submitted. Originals of any supporting documents that you submitted to USCIS with the adjustment of status application. Especially important examples include birth, marriage and death certificates as well as divorce decrees (if applicable). Your passport (unless you are in certain categories such as refugee/asylum). Doctor’s report from your required medical examination on Form I-693 (if you did not submit this report with the original adjustment application). If applying based on marriage, copies plus originals of documents showing your shared life, such as a joint lease or mortgage, joint bank account or credit card statements, children’s birth certificates, and so on. The USCIS officer will likely ask if you have any life changes that may affect your adjustment of status application. The officer is looking for anything that may change an answer on your application. Some examples include the birth a child, new employer, or new address. If your changes include an arrest or other immigration issues, speak to an immigration attorney before attending your I-485 interview. The typical adjustment of status interview lasts approximately 20-25 minutes. After introductions and swearing in, that doesn’t leave much time for questioning. It’s also not necessary to memorize answers to any questions. For the most part, the USCIS will ask you questions about your application and ask you to verify or explain certain answers. If you’ve truthfully answered questions on Form I-485, there’s no reason to be anxious. For applicants that filed an adjustment of status application based on spousal relationship, the questions will get slightly more personal. 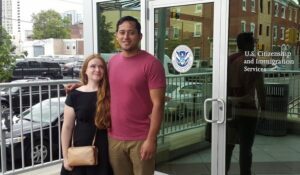 USCIS wants confirmation that the marriage is bona fide. In other words, they will scrutinize the application more to make sure there’s no marriage fraud. Where and with whom did your spouse live when you met your spouse? Who lives at your address now? Where did your spouse work when you met him/her? What is your spouse’s work schedule? How much is spouse’s salary? Are both spouses’ salaries deposited into the same bank account? What bank account do you use? Did your spouse have a car when you met? What model, color, etc? Are these the cars you and your spouse current drive? If not, when did you and/or your spouse change cars? If you now have cars, how much money is owed on them? How much is the monthly payment? When did you and your spouse decide to get married? Was there a proposal? Who proposed? When and where did it take place? Did you and your spouse live together prior to your marriage? Where and how long? When did you and your spouse move in together? If you had a celebration, what food/beverages were served? Did you and your spouse go on a honeymoon? If yes, where? Where does your landlord live? How many sleeping rooms does your home have? Are all the sleeping rooms on the same side of the home? What size bed do you and your spouse have? Can you describe the pieces of furniture in your bedroom? This is a small sampling of questions. In practice, USCIS can may ask a wide variety of questions to help make a determination if you and your spouse have a bona fide marriage. If everything goes well at your adjustment of status interview, the USCIS officer will approve your I-485 application. In some cases the officer may be able to place an “I-551” stamp inside your passport. Regardless, USCIS will process the new green card and mail to your address on record. However, other USCIS officers don’t provide a decision at the interview. He or she may tell you that you will receive a decision in the mail. Don’t be discouraged. This isn’t unusual. It’s also possible that a USCIS officer cannot approve your case because additional evidence is required. If USCIS requests additional evidence, be certain to submit the documentation requested by the deadline issued. USCIS will send you a decision by mail. If it’s been 90 days since your I-485 interview and you still don’t have a decision, schedule an InfoPass appointment with USCIS. It’s important to follow up. CitizenPath provides simple, affordable, step-by-step guidance through USCIS immigration applications. Individuals, attorneys and non-profits use the service on desktop or mobile device to prepare immigration forms accurately, avoiding costly delays. CitizenPath allows users to try the service for free and provides a 100% money-back guarantee that USCIS will accept the application or petition. We provide support for the Petition for Alien Relative (Form I-130), Petition to Remove Conditions of Residence (Form I-751), Citizenship Application (Form N-400), and several other USCIS immigration forms.